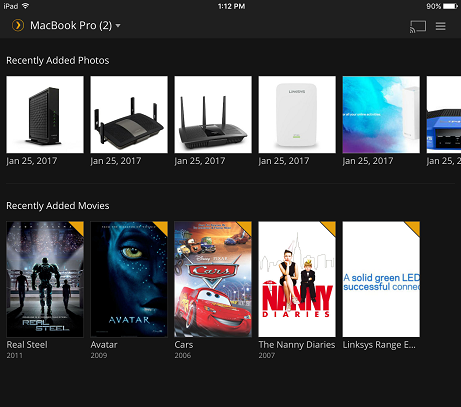 The Plex app allows you to view or stream your favorite media files such as movies, music and photos from your computer right on your iOS device over your wireless network. This article will discuss how you can view or stream your media content from your computer on your iOS device using the Plex app. Your iOS device and your computer are connected to the same network. The Plex Media Server is installed and running on your computer. To learn how to do this on your Windows® computer, click here. For Mac® computers, click here. On your iOS device, open the Plex app. Once the Plex app is launched, it will automatically detect the Plex Media Server running on your computer, then it will display the media files recently added to your Plex Media Server. Select the file you want to view or stream by tapping on it. It will direct you to the file's Pre-play screen. Tap the Play button to view or stream your media file. NOTE: If you select a photo, it will open it on the viewer at once without going to the Pre-play screen. QUICK TIP: You can view your other media files by tapping on bottom of the page, then choosing the category. You should now be able to view or stream the file you selected from your computer. With the popularity of throughput-intensive Internet activities such as high definition video streaming, there has been an increasing demand for wireless network devices with better performance and greater reach. The 802.11ac or the 5th Generation Wi-Fi® Standard has been designed to meet such needs.